Here we have it!! 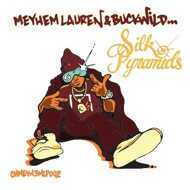 Several years in the making - the ridiculously dope Meyhem Lauren and Buckwild collabo album. Heads will know Mey from the host of Chopped Herring releases over the past 3 years and you MAY have heard of Buckwild from his crew D.I.T.C and his work with O.C, Big L, Organized Konfusion, Artifacts, Brand Nubian et al? There's not much else to say other than check the sounds - this will undoubtedly be one of the albums of 2014 and perhaps the whole Outdoorsmen era.